Revealed ; The super insulator that keeps some of the worlds great exploration yachts 'warm'.Fusion Boat and Yacht Insulation - the lifelong choice! 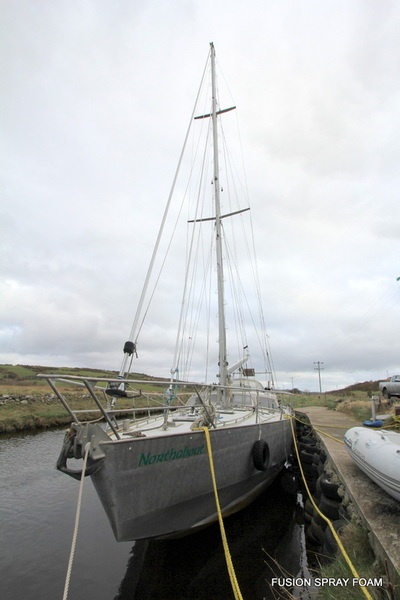 The great exploration vessel Northabout, seen here at its mooring at Westport Co. Mayo, and skippered by the intrepid sailor Jarlath Cunnane, has travelled into some of the most inhospitable seas on the planet. Making the famous North West Passage voyage and then North East Passage voyage this boat has rightly earned its place in yachting folklore. 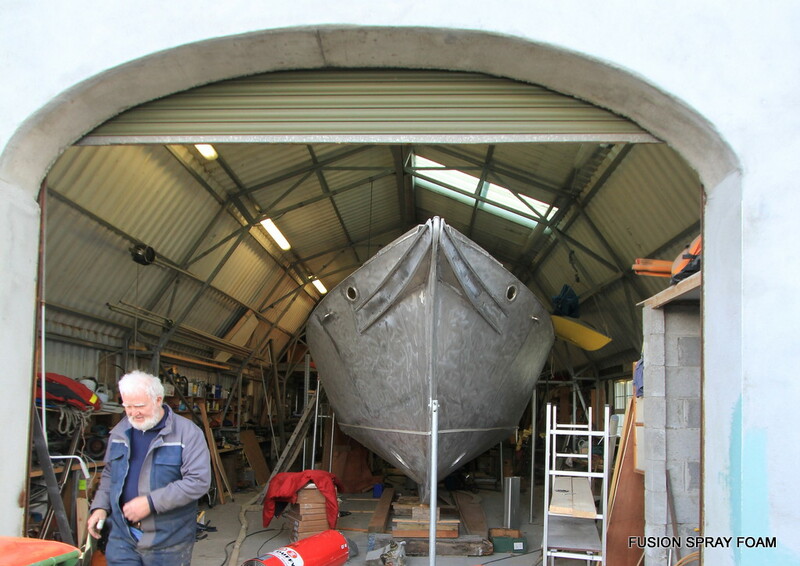 Alu Hulled Northabout II under constructionWhether it's steel, aluminium, Glass Fibre Epoxy or timber construction, the simple fact is your boat will sail and motor in water temperatures that are often close to freezing. Your attempts to heat your cabins, your chart and comm's area while valiant, are doomed to cause problems. That biggest problem is condensation. The warm humid air from your 'esbacher' air heater or similar will hit your hull and condensation will inevitably form. The end result will be dank and mouldy condensation inside your boat. Over time this condensation has the potential to create some massive repair and maintenance problems. Wiring, fittings and fixtures in the firing line of that condensation will suffer, as if the marine environment wasn't taking enough damage already . Metal and structural stringers in your hull could become compromised and potentially you are storing up thousands and thousands in long term repair bills. The solution then, is a really good insulation barrier on the inside of your hull. But which Insulation? 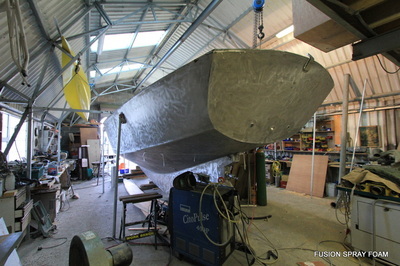 Traditional sheet and roll insulation's just cant hack it in a marine environment. You need an insulation that can withstand the demands of one of the most hostile environments in the world. 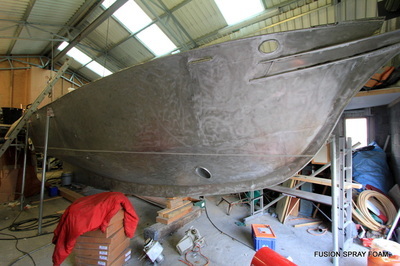 You need an insulation that is out of the ordinary, that has remarkable resistance to water, temperature fluctuations and salt action and yet it has to be flexible enough to be applied into the impossible and often inaccessible environments which is the interior contours of your boat hull, with its myriad compartments and structural ribbing and elements. Ribbing and Stringers getting entombed in High Density Closed Cell FoamThere is one insulation that makes the cut, makes the grade, and is worthy of 'coming on board' your yacht, your steel boat, your ship. That insulation is Fusion Closed Cell Insulation. Having class leading U values combined with its ability to remain fully waterproof and airtight, its physical toughness makes it literally the only choice when it comes to insulating your boat. 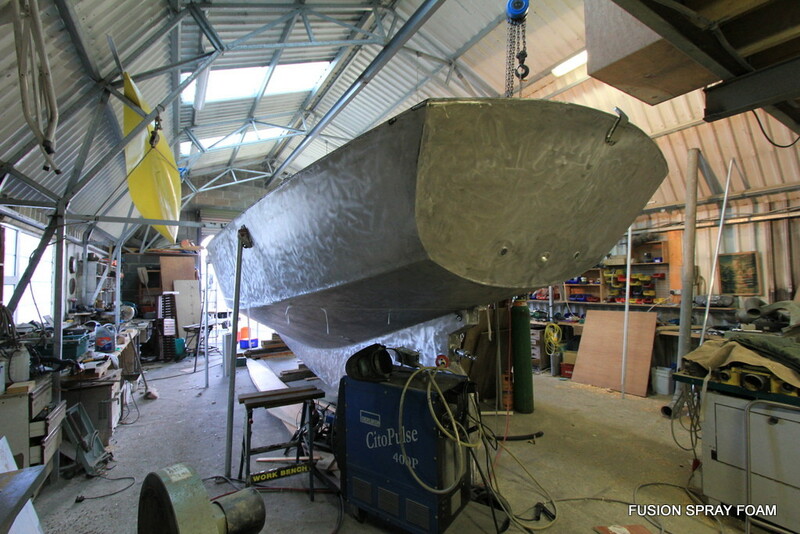 Fusion Spray in Your Hull Seamless Foam Insulation is like having an insulation factory at the end of your jetty, manufacturing and placing your ideal depth of insulation in a seamless airtight sheet. So phone us today, right now for a no obligation prompt and friendly quotation.